Christmas time is here, almost anyways! If your house is anything like ours, it has been a hectic few weeks. To begin the holiday party season, last weekend I was honored to co-host two different showers celebrating two lovely ladies. On Saturday, we enjoyed an ornament shower for a beautiful bride-to-be. On Sunday, the festivities continued with a white winter wonderland baby shower for a first time mom-to-be. We will save the details from the baby shower for another day because today, this post is all about the bride. One of my dear friends is getting married in April and our group of friends couldn’t be more excited for her! The only dare I say problem is that this bride-to-be is so loved that several people are planning on throwing her a shower. Since we knew that she would have more traditional bridal showers thrown for her in the coming months, my friends and I opted for an alternative to the classic shower. An ornament shower is a fun and unique shower theme that is perfect for the winter holiday season. When throwing a party or shower where guests may not be familiar with the theme, it is important to make sure that the guests know what to expect. This is especially true regarding attire and gifts. 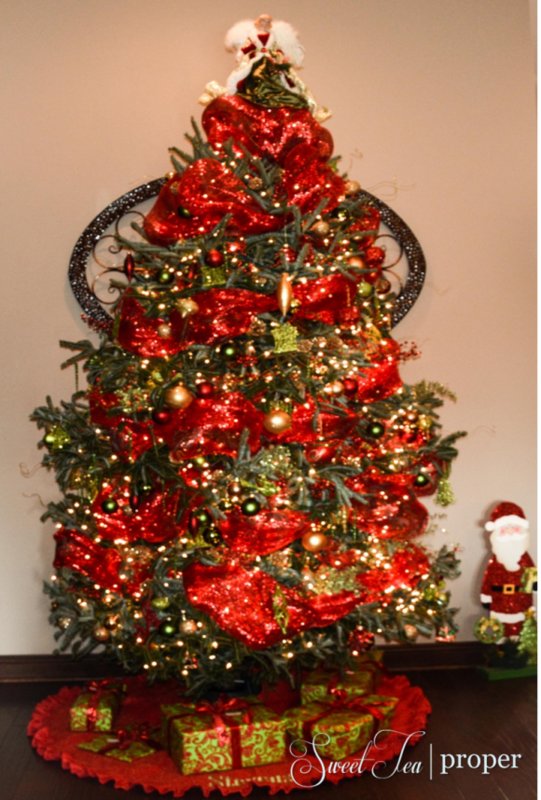 For an ornament shower, typically the gifts are either Christmas ornaments or a combination of Christmas ornaments and holiday decor. To help the guests with ideas, our bride created a “wish list” at Pier 1 that included all of her favorite holiday decor. 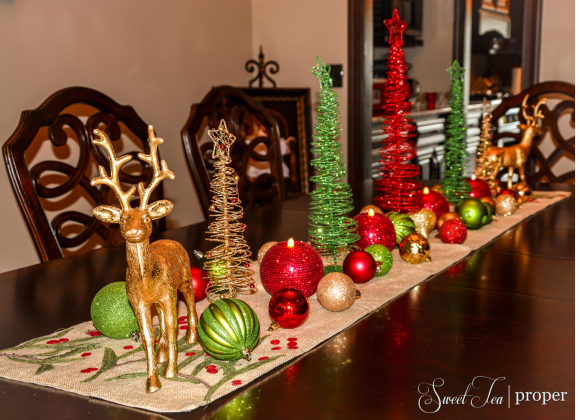 This made it much easier for guests to get an idea of her favorite holiday styling. The only downside with the wish list is the list does not update when things are purchased the way a registry does. Since I will most likely buy a present off of her registry for her wedding, I wanted to give her a more personal present for this shower. I purchased these two ornaments from the Etsy store The Craft Fish. 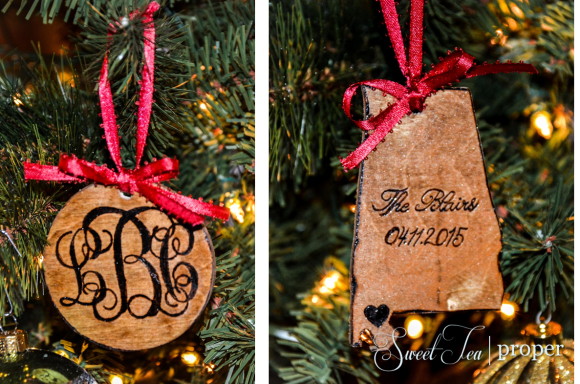 One ornament is a round wooden ornament with the couple’s monogram burned into the wood. The other ornament is also made of wood. It is shaped in the state the couple is getting married in (Alabama) with a heart over the county and includes their last name and wedding date. Our ornament shower was held at one of our girlfriend’s homes. She has a beautiful house any time of the year, but it is especially gorgeous during the Christmas season. Having a shower at Christmas time is especially easy to decorate since the holiday decor serves double duty. 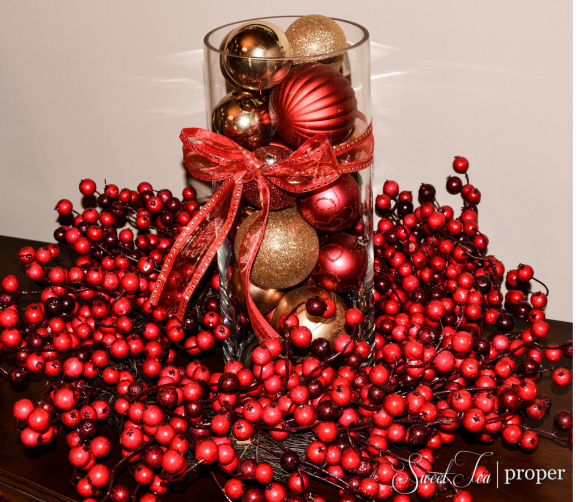 Red and green holiday decor could be seen in every room of the house. From the reindeer and ornament table runner, to the cranberry wreath candles, and massive real Christmas tree in the great room, the location was all set for the festivities! 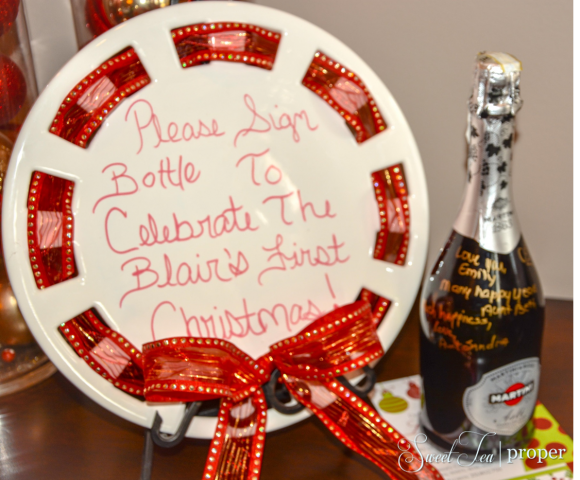 Upon entering, guests were asked to sign a bottle of champagne for the bride and groom to open on their first Christmas as a married couple. This holiday plate from Southern Living serves as both a decor piece and directions for the guests. We have recycled this one piece over and over again by changing out the ribbon and writing. 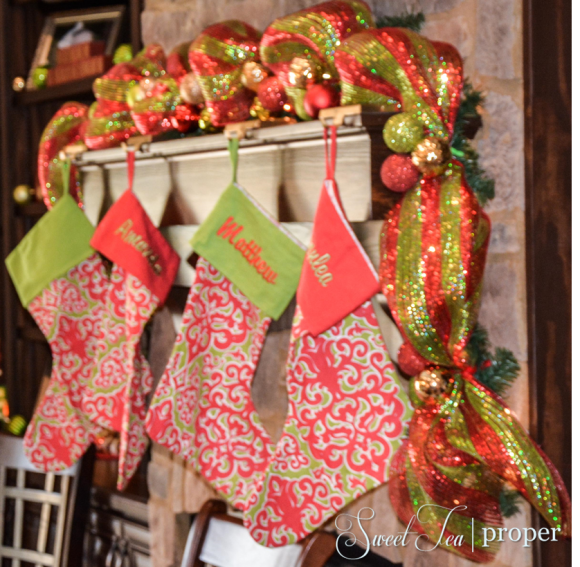 The stockings were hung on the mantle with care, which served for the backdrop for present opening. If you are new to hosting showers where there will be presents opened, there are two people who you will need on hand to make it easier for the person being honored. One person is needed to move the gifts and paper out of the way after the honoree has opened the present and the other person is needed to take down the names and gifts that the honoree receives. This allows the honoree to open the gifts with ease and have a much needed cheat sheet when she (or he) goes to write thank you notes. It wouldn’t be a party without a cake! 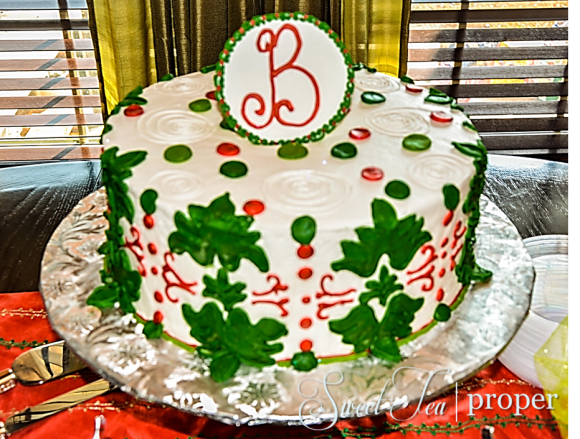 This red and green holiday cake was decorated to match the shower invitation and topped with the bride-to-be’s future monogram. A hot chocolate bar was setup on the cake table. Two large batches off hot chocolate were made in advance and kept warm in tall dispensers. Small vases were filled with all sorts of goodies including marshmallows, caramel bites, crushed Andes mints, peppermints, sprinkles, and more. One of the most stressful things about throwing a party is planning all of the food. By having several hostesses each bring one or two dishes, it ensures that there will be plenty of food without one person slaving away in the kitchen. Our spread included many party favorites including meatballs, cheese balls, dips (both salty and sweet), crescent roll bites, and other bite-sized goodies. To drink, we served a green punch along with a cabernet and chardonnay. 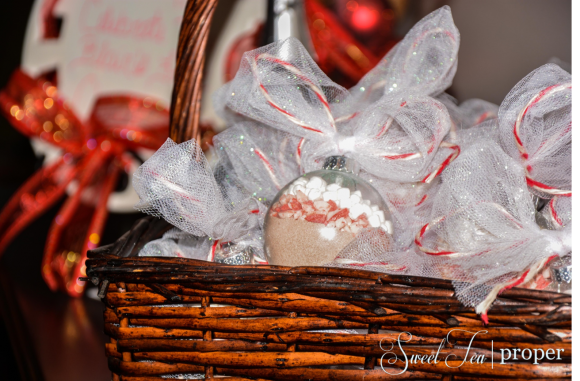 On the way out, guests were given a small ornament filled with hot cocoa mix as a favor. 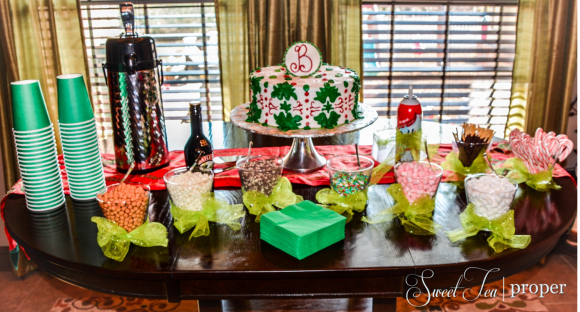 It was the perfect way to pull together the “ornament” theme and hot chocolate bar. We had such a good time hosting this party. If you’re looking for a unique holiday party idea, an ornament shower might just be the perfect theme!